← Like a candle in the wind. Falling in love with El Salvador. Anna Stout is aptly named. 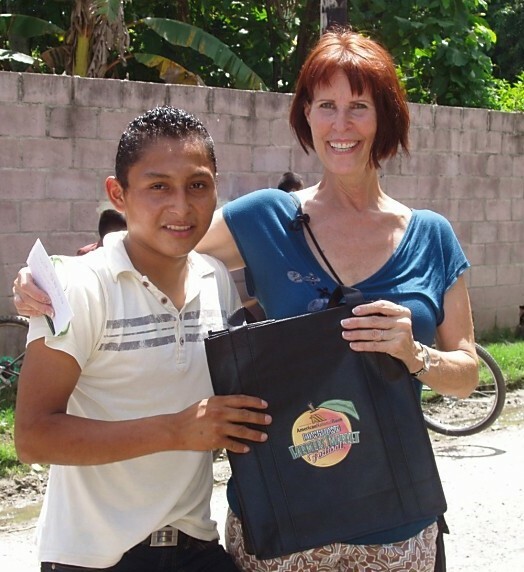 Not because she’s heavy – nope, she’s fit as a fiddle– but because she is stout of heart and stubbornly, passionately devoted to the people of El Salvador, and on a mission to make others fall in love, too. Anna is the president of the Foundation for Cultural Exchange in Grand Junction, Colorado, where she single-handedly runs the organization (while getting her masters and working full-time). 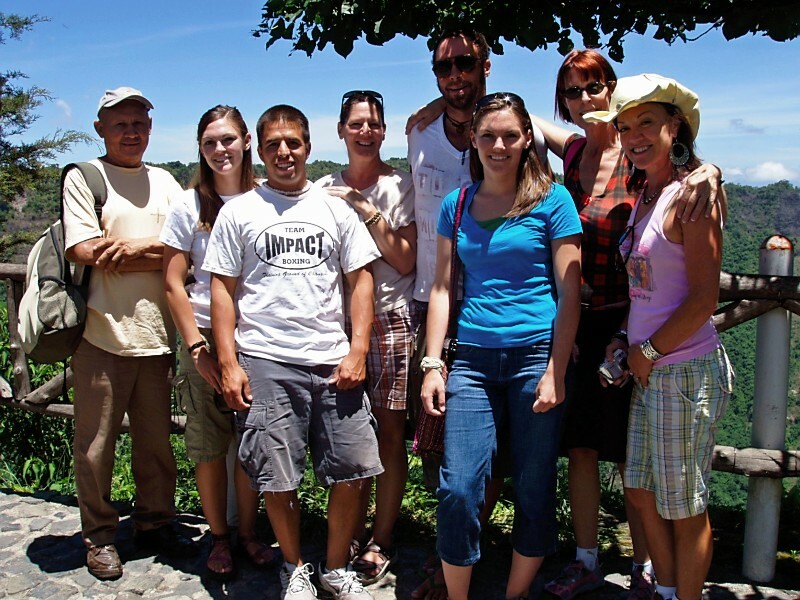 Founded in 2004 by the late David Harmon, Anna’s Sociology professor at Mesa State College, FCE’s mission is to foster a Sister City relationship between Grand Junction & El Espino – a tiny rural community about 45 minutes outside San Salvador. By taking people on cultural immersion trips to this country that is still struggling to recover from a brutal civil war that tore the country apart 20 years ago, Anna seeks to build solidarity, friendship and economic support for the beautiful, endearing people of El Espino. 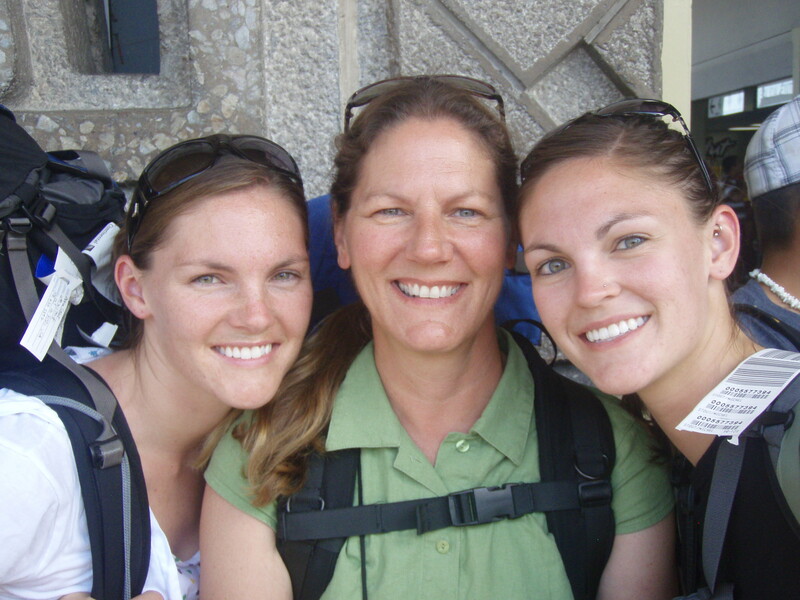 I went on the trip in Summer, 2009 with my friend Clarice and her son Forrest, and it was a trip I’ll never forget. Our group--Anna's in the blue. We started in the capital city of San Salvador, staying in a tiny hotel where Clarice & I shared a room and kept everybody up all night laughing our heads off. But the things we saw weren’t quite so amusing: the home and chapel of Archbishop Romero, the quiet “Voice of the people without a voice,” who was gunned down while saying Mass in 1980, and the San Salvador Cathedral where his tomb is lovingly touched by peasant women with tears running down their faces. Students practice their English with Forrest. We hiked a volcano and visited an organic coffee cooperative run by a woman whose husband had been murdered in the revolution. And then we headed for our home visit to El Espino – where we met the five scholarship students FCE is supporting (after 6th grade, school is not free in El Salvador) and were introduced to our host families. 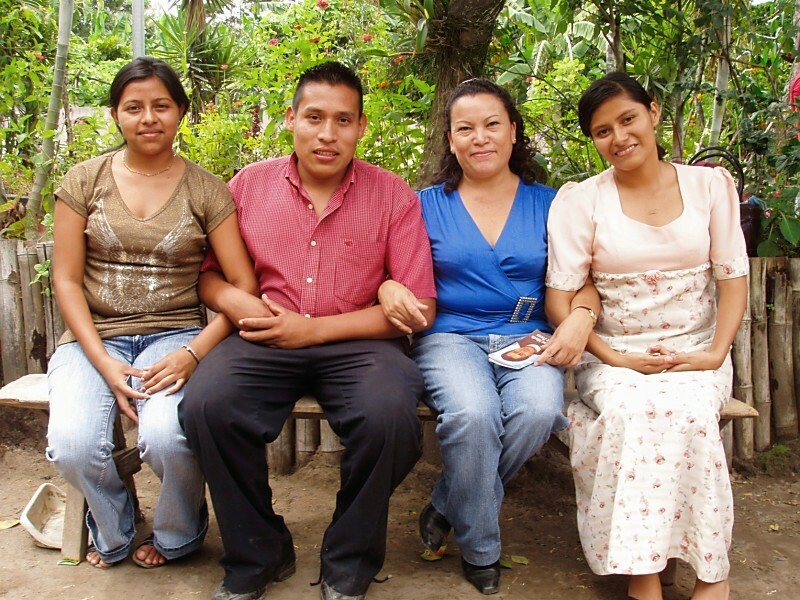 Inosencio, an FCE scholar, and his family. Clarice and I lucked out—we were staying in a cement room off the cozy house of Gloria & Angel Carretera, and Gloria was a wonderful cook. Forrest, on the other hand, was staying in a corrugated tin shack that leaked rain onto his bed, and while we were eating lovely huevos rancheros, he was breaking teeth on hard pinto beans and cold tortillas. But nobody had running water or flush toilets, and you quickly learned the preciousness of water, light and heat. We spent our time in El Espino meeting with community organizers, finishing off the new kindergarten room FCE had funded, watching an impromptu town baseball game, and teaching our “little brother” and all his friends to play poker– Clarice’s brilliant cross-cultural, no-Spanish-necessary activity that transcends language, age, and culture. We fell asleep laughing in the pitch-black at 9 pm on rock-hard cots and woke up at 5 am to huge trucks rumbling by, ten feet from our heads. Despite the poverty, it was one of the richest trips of my life because the people were so generous, sweet and cheerful– and eager to share whatever they had with us. Clarice makes a new friend. Today I’m sending $100 to the Foundation for Cultural Exchange for the brilliant work it’s doing to help the people of El Espino support development and community initiatives; rebuild houses destroyed in hurricanes (a mere $3,130 from FCE built 3 houses for the most needy families last year); fund projects like the school auditorium that was just inaugurated, and send kids to school so they can lift their families out of poverty. 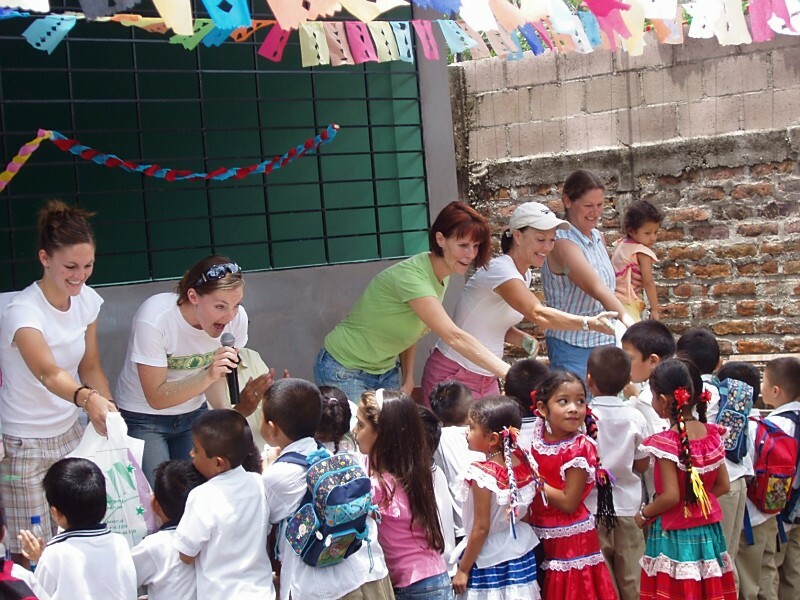 Giving gifts from the people of Grand Junction to the people of El Espino. If you want to fall in love with a village and really get to understand a Central American country, I wouldn’t miss this trip for anything. To contribute (or make your reservations), contact FCE here . * To learn more about El Salvador, watch Romero, starring the inimitable Raul Julia, and Salvador, Oliver Stone’s last best movie starring a ferocious James Woods and Jim Belushi. Dear BB — One of the most remarkable things about traveling in these developing places is how delightful, cheerful and lovely the people are — even when they are living in very poor circumstances. A lot happier than plenty of the people I see around me every day, living in abundance. Families are very close-knit and extended families stay together in these villages– and that makes for a very social and supportive community that I really envy. I’m always struck by their love of children, hope for the future, and courage in facing challenges–very inspiring! We have many people moving to our northern climate from warm El Salvador, and it’s sometimes a little bewildering. But now I have a little more understanding about the conditions in many parts of that country. What continues to amaze me is the humor and generosity — and all of the happy faces — so evident in your words and pictures. Makes me think there’s a lot we can learn from them. Sorry for the somewhat delayed response to your post, but I wanted to tell you that I really appreciate your thoughts. The person that I was the first time I went down to El Salvador at the ripe young age of 19 is now like a stranger I met in passing many years ago. Your statement “there’s a lot we can learn from them” is what makes that person foreign to me. 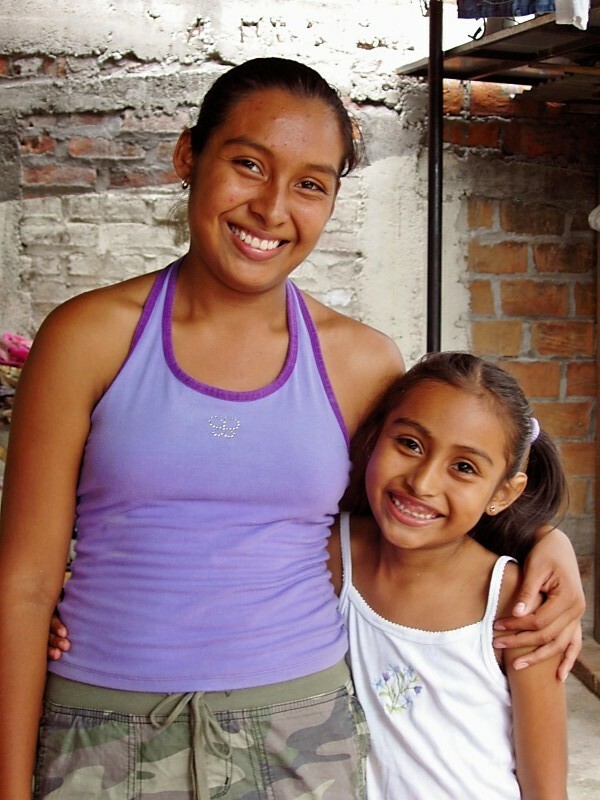 The Salvadoran people have taught me–no, transformed me–in ways that I never expected nor would have thought possible. I have never known happiness in my own culture that rivals that of the people of El Salvador that I have come to love so dearly. I wish I could share the 9000+ photos I have on my computer of the tens of thousands of smiling faces I have encountered there! Thanks so much for featuring this wonderful organization! I was a member of the 2007 delegation, and returning became a member of the board of directors for FCE. 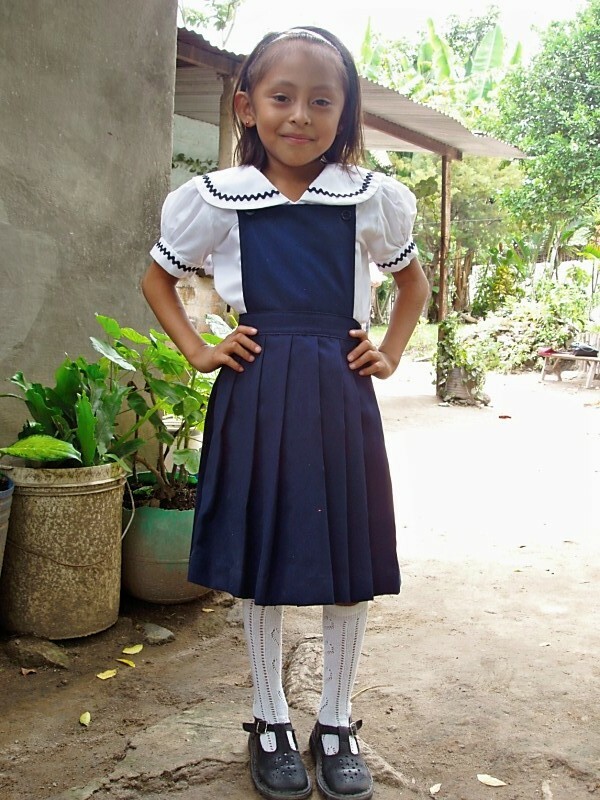 The “Ready for School” photo brought me to tears, it was my “grand daughter of the heart”, Lupe, whose family of 9 gave me shelter, good food and their hearts. They are very close to me over the miles that divide us. The photo “Clarice makes a new friend”, Lupes’ brother Anselmo. The only thing that kept me away the last 3 years was surgery for a new knee , and a broken bone. I’m planning on going back in 2011. We hope to continue to provide new scholarships each year, while seeing our current scholars through their college educations as well as giving a hand up to projects the community identifies and plans.